One of my most recent projects was updating an existing custom MVC application which used Entity Framework (model first approach) to query data. The home page retrieved articles on the stock price performance of companies for a selected stock exchange from the SQL database. Under normal circumstances, the home page loaded efficiently, but when new data was being populated in the database, the home page timed out. It was clear that some type of lock contention was occurring in SQL Server for the home page query. After a bit of research and some code / SQL profiling, we concluded that two things needed to be addressed with the way the system was currently working. We needed to fine-tune the query to ensure that only the data we really needed should be retrieved. The default query generated by EF was retrieving too much information. We wanted to be able to set the transaction isolation level so that we didn’t need to wait for row locks to be released, even if that meant getting a slightly stale version of article data. Ordinarily to address issue #1, we could modify the EF method calls to ensure that only the essential data needed was retrieved. However, to achieve #2, it looked like the best route was to write a custom stored procedure to retrieve the article data required for the home page and then update Entity Framework to use our fine-tuned stored procedure instead of the default query generated by EF. Here’s how we went about doing that. 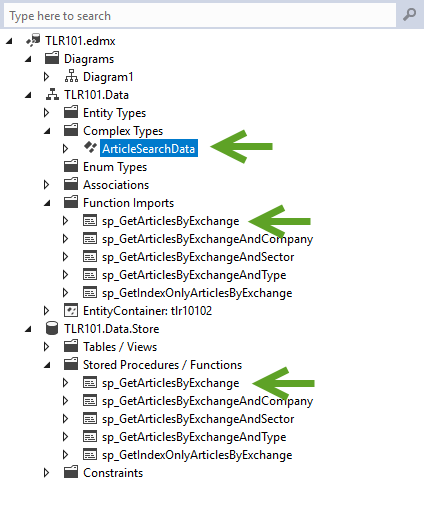 Examining the code generated by the update to Entity Framework, we could now see that our database context offered a new method named after our stored procedure, with a return type of our new ArticleSearchData complex type. The key difference here was the new complex type being returned instead of a class based directly on our table model. The stored procedure was now giving us a class object with properties for every column returned by the SELECT query in our stored procedure. Instead of getting a hierarchy of related classes, we were now getting a single object type with a flattened structure that had properties for each of the related entities we needed to display our home page articles. The new objects returned by the Entity Framework function import now needed to be fully integrated into the MVC application so that the correct information would appear in each view. Update the articles repository to make a new call to the stored procedure method call added to our data context, passing through any required search parameters. Update object mapping methods to convert the ArticleSearchData structures into view models required by the MVC application. In addition to improving the performance of the query we used for fetching data, we also performed some basic analysis on the existing SQL tables to see if we could add some configuration in SQL itself to help improve query performance. In fact, this is a key step to troubleshooting or preventing any performance problems related to a SQL database. Using the Database Engine Tuning Advisor tool that comes with SQL Server, we identified some additional indexes to add to some of the tables in the database which further improve site performance. We created a trace in SQL server profiler and loaded the home page of the site, then navigated to key functions on the page, in order to collect database workload data. After feeding the workload data into the Tuning Advisor tool, it provided us with recommendations on new indexes to add to key tables so that queried data would be returned quickly.